Note Pads are a time tested way for customers to advertise their company in a cost effective manner. 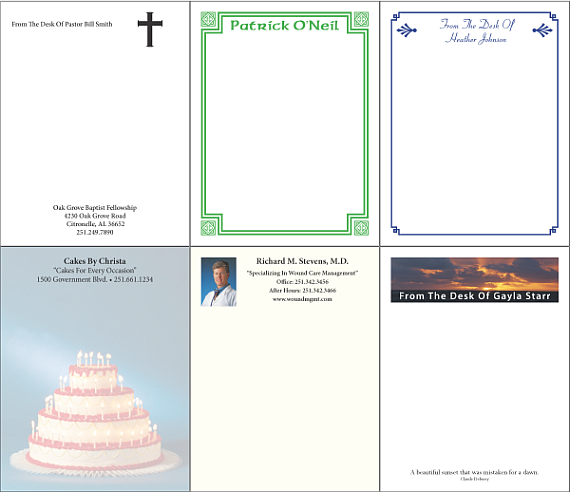 We can provide memo pads customized with names, company information, or personal messages of any kind. These pads can be produced in black and white, a single color, multiple colors or affordable full process color. You may provide a design or have us produce one for you. These pads are also a way for a distributor to show appreciation to his customers by providing them with a tangible personalized product they can use on a daily basis to keep your brand in the top of the mind of your customers. Our note pads are produced padded with clear white or red padding with a chipboard backer on each set of pads. Pads are typically produced with 50 sheets to a pad with 8 pads up on a sheet.